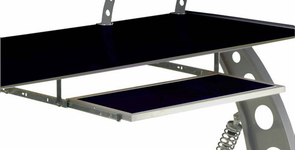 Increase the functionality of your Grand Prix desk! PitStop Furniture has become a name synonymous with race-inspired form and utilitarian function. The PitStop Furniture Racing Style Pullout Keyboard Tray is PitStop’s way of providing you with the option of even more functionality. If you use your PitStop Grand Prix Racing Style Desk as a computer workstation, the PitStop Furniture Racing Style Pullout Keyboard Tray provides you with the perfect spot to stow your computer’s keyboard when not in use. The PitStop Furniture Racing Style Pullout Keyboard Tray is composed of a metal alloy frame that supports a tempered glass tray. This metal and glass combo provides solid support for your keyboard and hands. This easy to install unit gives you the freedom to hide your unsightly keyboard when it’s not being used, so that you can maintain a neater workspace. PitStop Furniture Racing Style Pullout Keyboard Trays are designed and assembled in the USA from the highest quality materials available. PitStop Products are backed by an Intro-Tech Automotive, Inc. lifetime warranty. The quality in craftsmanship is evident in each piece of PitStop furniture.